Need information on doing business in the Tri-Counties? Look no further. 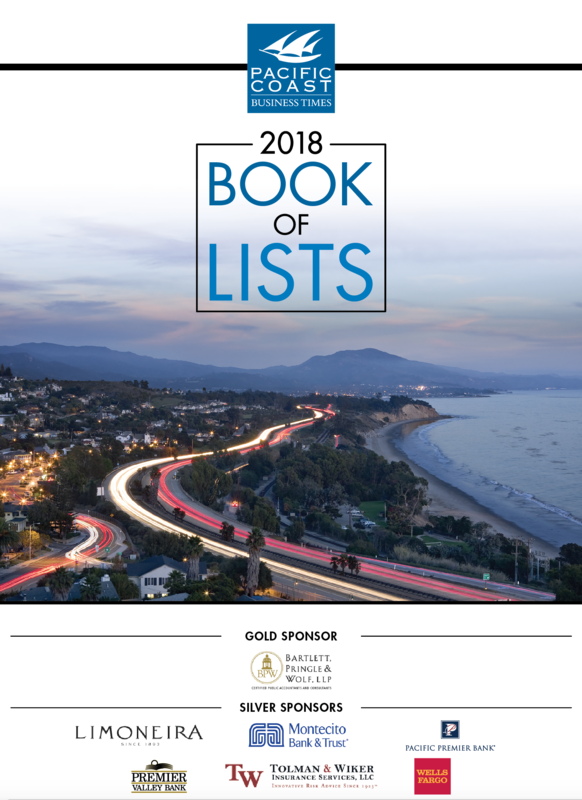 Business Times reporters and researchers have compiled data on literally thousands of companies in Ventura, Santa Barbara and San Luis Obispo counties. Lists that have been published this year are listed below in alphabetical order. For lists from previous years, use the drop down menu. Top 25 list of Banks based in the Tri-Counties. The 2016 list of the top 50 fastest-growing companies in the Tri-Counties, based on three-year revenue growth. Special section with profiles on select companies published Aug. 22. 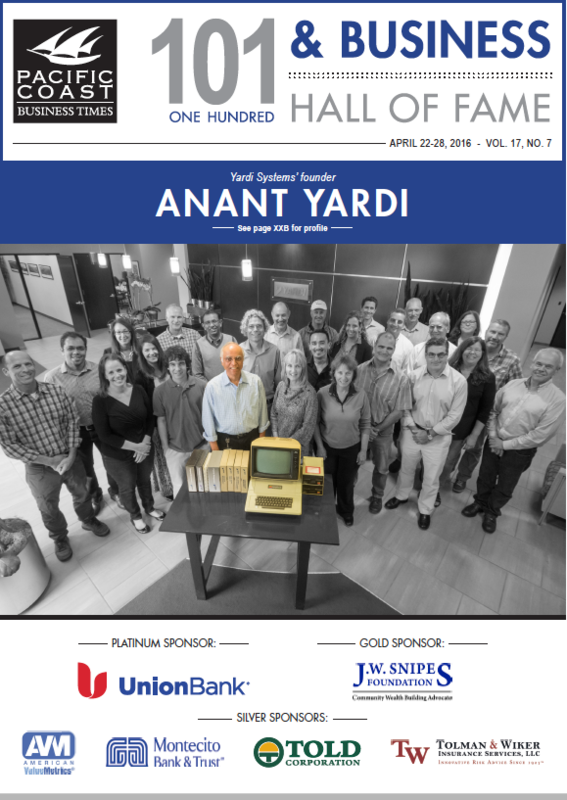 101 One Hundred features the Tri-Counties’ top 20 public companies, the top 50 privately held companies, the top 15 employee-owned companies and the top 15 companies to watch. A list of the top 25 largest architecture firms in the Tri-Counties. A list of all of the banks based in the Tri-Counties, ranked by total assets. A ranking of banks based outside the tri-county region. A ranking of the region's 24 chambers of commerce by members. A list of the top 22 commercial real estate firms in the Tri-Counties. A list of the top 20 largest CPA firms, as ranked by by number of accounting professionals in the Tri-Counties. A list of all 11 tri-county based credit unions including asset and revenue data. A list of the top 26 largest employers in SLO County. A list of the top 25 Employers in Santa Barbara County ranked by number of employees. A list of the top 25 employers in Ventura County. A list of the 20 largest engineering firms in the Tri-Counties. A list of the top 20 largest foundations in the Tri-Counties. A list of the largest general contractors in the region, as ranked by revenue, and then number of employees. A list of the all hospitals in the Tri-Counties, ranked by number of beds. A list of the top 60 largest hotels and resorts in the region. A list of the largest IT service providers in the region, as ranked by number of employees. Top 25 list of law firms with offices in the Tri-Counties. Includes both firms based in the region, and those based elsewhere with offices in the Tri-Counties. A list of the top eight largest law firms based outside the Tri-Counties. Top 15 List of Moving and Storage companies in the Tri-Counties. A list of the top museums in the Tri-Counties. A list of the 25 largest nonprofits in the Tri-Counties. A list of the largest 25 office parks in the Tri-County area. A list of the 20 most expensive ZIP codes in Ventura, Santa Barbara and San Luis Obispo counties, ranked by home value. A list of the top private companies in the Tri-Counties. A list of the top 20 property management firms in the Tri-Counties. Top 10 SBA lenders headquartered outside the Tri-Counties, as ranked by number of loans made in the Los Angeles and Fresno districts of the SBA. A list of the 20 largest software development firms in the Tri-Counties, ranked by number of employees. A top 25 list of the largest staffing services companies in the Tri-Counties. A list of the largest stock brokerages in the Tri-Counties, as ranked by number of brokers. A list of the top agricultural crops grown in the Tri-Counties, as ranked by total dollar value. A list of the largest tri-county wineries, based on number of cases produced annually. A list of the 20 largest women-owned companies in the Tri-Counties, as ranked by number of employees in the region.